Of all the bizarre cars I talk about wanting to own one day, the Citron XM is one that I will own. There is no doubt about that in my mind. They are getting close to that magic 25 year old mark, when I could import one with no problems. 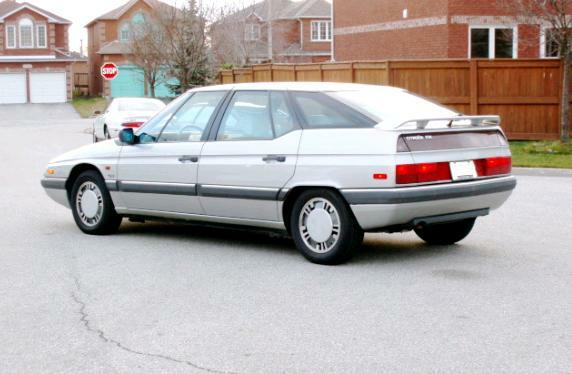 There are plenty of people out there who don't consider this a real Citroen. It was designed and produced after Citroen was taken over by Peugeot. I look at it as a Citroen anyone could love. 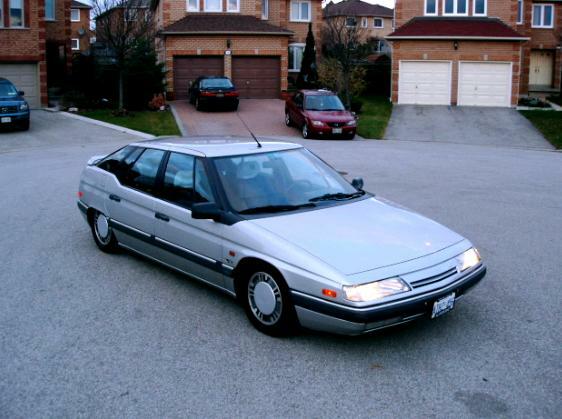 Earlier Citroens were incredibly engineered, but truly bizarre cars. They were an acquired taste. They looked as if they could have been designed on another planet. Their 4 cylinder engine was almost as old as the planet. The XM was the first car to be fitted with a "Hydractive" suspension, an update of Citroën's famous Hydropneumatic suspension. The XM has two additional suspension spheres that can be used to vary the car's ride. 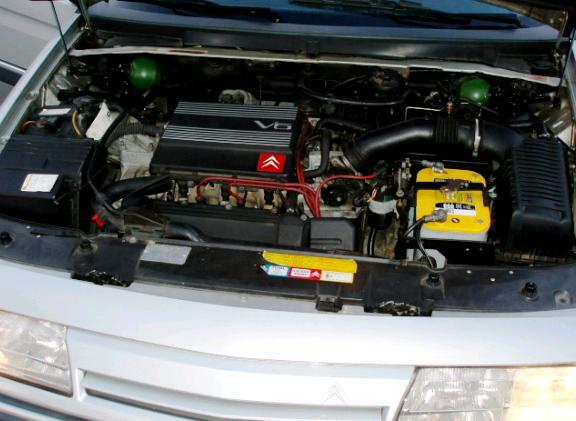 Sensors attached to the steering, accelerator pedal, brakes, vehicle body and gearbox are connected to a computer that continuously varies the both the suspension spring rates and damping to provide a soft ride for comfort and a taut ride for handling and road holding. 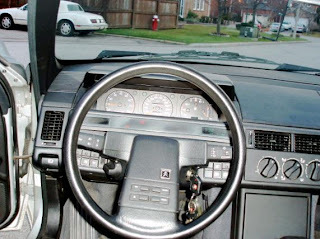 A switch enables the driver to leave the computer to its own devices or to offer a firmer "sport" setting. The interior had many Citroen touches, but was more conventional than any previous Citroen. The XM was not without problems. The biggest problems were electrical, much of which can be traced to corroded grounds. None of the above, the good or the bad, matters to me. This is a car I'd buy for the body. I like wedge shaped cars (or cars that are "angular and slightly disproportionate", as a friend says) and this is the perfect wedge. In my eyes it's a car with presence. It's classy and sporty at the same time. This car is located in Mississauga, Ontario, Canada. Being a 1990 model year, it would be tough to title in the US. However, it seems like other people have found ways with other cars to get around this. The seller is willing to deliver it to Saratoga, NY in June. If you go to Saratoga to buy the XM, stop at a restaurant called Hattie's Chicken Shack. I was lucky enough to be living in Albany, NY, when Hattie and her husband still operated the restaurant. Hattie opened the restaurant in 1938. By the time I was eating there - 3 or 4 times a month for a couple of years in the early 1980s - Hattie and her husband were in their 80s. (Hattie was not 100% sure when she was born, she "thought" it was in 1900.) She and her husband had the coolest old - early sixties, maybe - Cadillac convertible, which was always shiny and always parked out front. Hattie would often lecture me about my dislike of cooked green vegetables. Hattie and her husband are long gone, but the restaurant and her recipes still live on. I still try to eat there once or twice a year. If you like fried chicken and / or New Orleans style food, you won't find a better place. Nope, this is not turning into a food and restaurant blog. I just can't think of Saratoga without thinking of Hattie, her husband, their Cadillac and great food. The first time I saw an XM was in France, right when it hit the market. It was featured center stage in a brightly lit Citroen showroom. Compared to everything else on the road, it was jawdropping. It appeared to me like a futuristic "supercar." The odd thing that I will never forget was that a brand new 2CV (Deux Chevaux) was sitting right next to it on the showroom floor. Another story regarding the XM is as follows. I had a few friends in France who worked summers manning the phones for a travel assistance group similar to AAA in the USA. These are the folks you first call when your car breaks down on the road. When the XM was announced, it was quite expensive. However a few older (mostly retired) well heeled folks in France snapped up the first models. 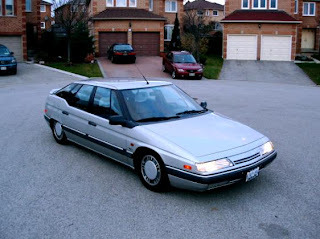 As the XM was hailed by the press as a superbly comfortable "Grande Routière" capable of covering huge distances, these folks intended to tour France during "les vacances" with their new XM's. During that first couple months, the calls from stranded XM owners started pouring in. Keep in mind that vacations are nearly sacred to the French population. These people were furious, and Citroen was soon bending over backwards offering stranded XM owners free rental cars and luxurious hotel rooms. It was also strongly suggested that the company was offering "compensation" to offset any "inconvenience" - if you get my drift. The company was terrified that if word got out, sales would stall. The bottom line is that these efforts went way beyond mere "damage control." During that first summer it was quite a "scandale" to the workers manning the phones, and as you can well imagine, they were pretty much sworn to secrecy by their bosses. I love the XM and even the less desirable Pug 605, but both cars nearly finished the manufacturers off. Nice, low millage examples across the pond at all $1k or less, a lot of car for the money but be prepared for the electrical gremlins. The new Citroen XM, the C6, is a huge step forward, an amazing car...only another 20 years to go till I can import one..
My father in law has one of them fom the year 1998 and it's awesome!! I had the opportunity to drive the xm from Barcelona to Warsaw and then to Croatia everything in 20 day on 2005, and I can tell you is one of the best cars ever done. My wife has a Toyota Corolla 08, is a plastic toy that comsumes oil like crazy and need to be changed the breaks each 6 months. XM had bad reputation from the firts serie in 90' but after that the machine, electornics and all rest improved. I've decided to keep the car and I am driving it since 2years (about 80,000 per year) and ZERO problems,just the common oil changes but any single situation! I was visiting a local Midas shop in Mississauga located on Dundas Street East as I was trying to see if the place had some silencer fabricators to basically retrofit the tail and the European fittings for my Citroën XM, my car is always parked in my garage, however I decided to take just the muffler out as it had some leakage and it was an original muffler (20years old, since the car was new), I managed to order same type muffler locally from the CDC warehouse also located in Mississauga, only the muffler didn't come with the end bits and since there was nothing wrong with my OEM muffler, the Midas shop was welding them for me on the new Silencer along with the new hangers, all this was done to keep the XM from being butchered by a non-Citroën workers. Whilst the XM muffler was being retrofitted, a young man was very keen to find out what this car Citroën was all about, so he was researching the internet to find out, when they called me as to what it was and I said an XM was the model, 'what year?' 'so I said 1990' and not until then was he actually looking at this http://www.justacargeek.com/2010/05/1990-citroen-xm.html that he called me and asked if this is the type of XM and just then I saw the very XM in the pictures and thought to myself that wow unbeknown to myself someone have actually used the very same pictures that I had taken with my Olympus Stylus which I had placed for sale on the ebay and wondered about this and so here I am the owner of this 1990 XM 3 Liter V6. I have had one serious offer with a deposit from a Pilot and his mistress from Western Canada, however on the day of the pickup they decided not to purchase it as the reason that they gave me was that the earlier XM's had many problems, although they had driven my XM extensively for a test drive a few days earlier and were impressed with both the condition as well as the smooth Silky ride, they were also happy with the price and I was also made aware that my XM was completely Original with the full service history and all the data. In a way I am glad that they did not purchase it and should they offer to buy it again, I would decline it, it basically is their loss and my gain as I will enjoy it until someone is straight with me and is serious to purchase it. I have several Citroëns and out of them all this is in the best condition. Due to loss of my job as well as health reasons I can't drive on my own, my better half and I have since been trying to see if we can sell some cars(I had over 14 Citroëns, most of them are sold, only 4 remaining will probably go to a good home when I am done with life). I was visiting a local Midas shop in Mississauga located on Dundas Street East as I was trying to see if the place had some silencer fabricators to basically retrofit the tail and the European fittings for my Citroën XM, my car is always parked in my garage, however I decided to take just the muffler out as it had some leakage and it was an original muffler (20years old, since the car was new), I managed to order same type muffler locally from the CDC warehouse also located in Mississauga, only the muffler didn't come with the end bits and since there was nothing wrong with the end bits of my OEM muffler, the Midas shop was welding them for me on the new Silencer along with the new hangers, all this was done to keep the XM from being butchered by a non-Citroën workers.